Rickenbacker used just one confirmed DeArmond pickup, in the Combo 400 single-pickup solid guitar, produced from 1956 to 1958. 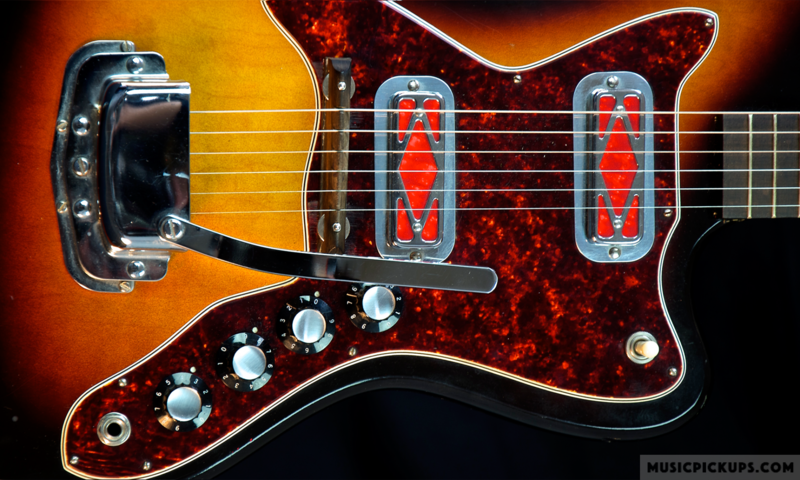 The pickup’s bezel is hidden beneath the gold-anodised aluminum pickguard, as shown below. This pickup also appears to have been fitted at the bridge position in the 1957 Combo guitar. This pickup was also used in the Harry Volpe Model Epiphone guitar seen in the Epiphone section, with a visible bezel. The 1957 Combo 1000 guitar’s two black bar pickups with a rectangular top plate appear to be by DeArmond, as fitted in a Silvertone branded guitar. Rickenbacker Model 400 combo single-pickup solid guitar. The pickup appears to be a basic bar type when viewed from above, but the view from below shows that it has a flexible, chrome archtop-compatible bezel attached, stamped Rowe Industries.